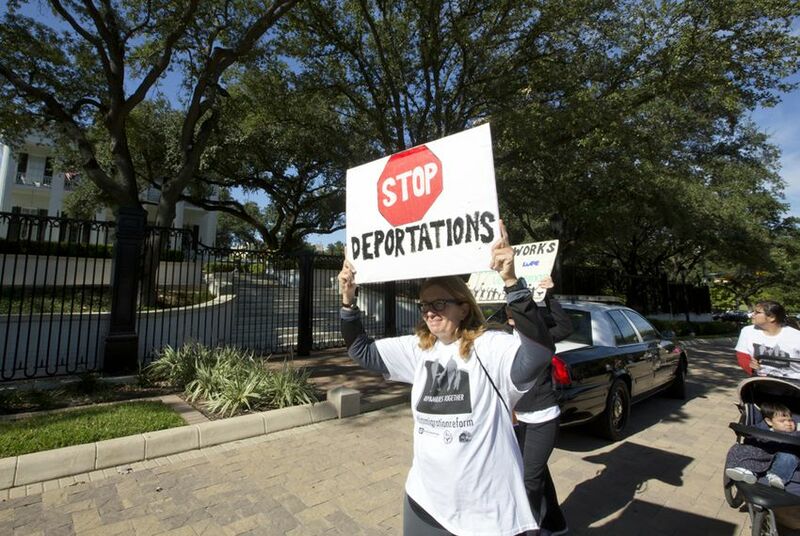 Texas Attorney General Ken Paxton’s office said on Thursday that his office was sticking with a Tuesday deadline set by officials from Texas and nine other states for President Donald Trump to rescind a popular Obama-era program. Texas Attorney General Ken Paxton’s office said Thursday that Paxton was sticking with a Tuesday deadline for President Donald Trump to rescind a popular Obama-era program or face a lawsuit. Meanwhile, a White House spokesperson said that despite rumors to the contrary, the program, Deferred Action for Childhood Arrivals, or DACA, is still under review and a decision on its fate hasn’t been made. “The court-ordered deadline in DACA was set several weeks ago, and we are completely prepared to comply with it on September 5,” Kayleigh Lovvorn, a Paxton spokeswoman, said in an email. Started in 2012, DACA has awarded more than 800,000 recipients, including more than 120,000 Texans, a renewable, two-year work permit and a reprieve from deportation proceedings. It applies to undocumented immigrants that came to the country before they were 16 years old and were 30 or younger as of June 2012. On June 29, Paxton urged the U.S. Department of Justice to end the program, claiming it was an unlawful overreach by former President Obama. Paxton and nine other state attorneys general told U.S. Attorney General Jeff Sessions that, should the program still be intact on Sept. 5, they would take legal action by amending a 2014 lawsuit filed in Brownsville to include a challenge to DACA. The 2014 lawsuit was filed in response to a separate Obama administration initiative, Deferred Action for Parents of Americans and Lawful Permanent Residents, which would have expanded the eligible population of the DACA program and lengthened work permits to three years. That program was never implemented after Paxton successfully challenged the program in a Brownsville courtroom. CNN reported Thursday that Trump was looking into an extension of the deadline as Texas is in the middle of recovery efforts after being belted by Hurricane Harvey. That story came as a bipartisan group of American mayors urged Trump to keep the program during a DACA National Day of Action earlier this week. Later Thursday, Fox News reported that a decision had been reached and an announcement would be made Friday. White House spokesman Sarah Huckabee Sanders later shot down those rumors during a press briefing. DACA Gave Thousands of Undocumented Texans Hope. Will it Survive?